Earlier this year, a huge bust in China shut down a major pipeline that had been funneling pirated Microsoft and Symantec software to the U.S. market. Some partners helped the pirates. Some partners sided with authorities. Over the summer, authorities in China raided factories in southern China that were pumping out thousands of illegal copies of Microsoft and Symantec software. In all, they seized $500 million worth of counterfeit software and certificates of authenticity (COAs) of such high quality that both were reportedly nearly indistinguishable from legitimate goods. At the same time, the FBI raided more than two dozen sites in the United States, where an estimated 70 percent of the software from China was headed. In urging authorities to action in rolling up the operation, Microsoft relied on a big dose of cooperation from Microsoft partners. In fact, according to company officials, "scores" of partners played a role. Technological developments and business practices are getting partners more involved in piracy questions. Some stand with authorities; a few find themselves aligned with the pirates. "This case represents a milestone in the fight against software piracy -- governments, law enforcement agencies and private companies working together with customers and software resellers to break up a massive international counterfeiting ring," Brad Smith, senior vice president and general counsel at Microsoft, said in a statement. David Finn, Microsoft's associate general counsel for Worldwide Anti-Piracy and Anti-Counterfeiting, has described the piracy ring as the leading producer of high-grade counterfeit Microsoft products. In an official response to the case, the company stated: "Countries around the world are expected to experience a significant decrease in the volume of counterfeit software as a direct result of this action." The Chinese government didn't issue a formal statement acknowledging or describing the anti-piracy enforcement actions. According to the FBI's official announcement of July 23, the Chinese Ministry of Public Security (MPS) raided businesses and residential locations throughout southern China, with the major facilities in Shenzhen, which is near Hong Kong, and Shanghai. The MPS arrested 25 people and seized $7 million worth of assets and 290,000 counterfeit software disks and COAs worth an estimated $500 million. In keeping with the FBI's assertion that about 70 percent of the counterfeit software was headed for the United States, the FBI's Los Angeles field office coordinated two dozen raids, seizing $2 million in counterfeit software and about $700,000 in assets. In all, counterfeit Microsoft software surfaced in 27 countries on every continent but South America and Antarctica. Authorities seized fake versions of 13 different Microsoft products, including Windows Vista, Windows XP, Microsoft Office 2007, Microsoft Office 2003 and Windows Server. Microsoft, which poured its own resources into the multi-year investigation, went beyond the FBI's estimate of the value of the seized software to hazard a guess at the total amount the software piracy ring produced over its criminal career. Microsoft's conclusion: "The syndicate is allegedly responsible for manufacturing and distributing more than $2 billion worth of counterfeit Microsoft software." According to Microsoft, more than 55,000 sophisticated-quality copies of counterfeit software were traced back to the southern China criminal syndicate. Microsoft officials contend those 55,000 disks constitute less than 1 percent of the millions of counterfeit copies that the syndicate produced. Given the apparent longevity of the syndicate's operations and its scope, the $2 billion estimate is probably conservative. Microsoft's 75-member anti-piracy team had been tracking a Chinese syndicate as far back as 2001 after bootleg disks turned up in Southern California, according to published reports. Much like technology companies, the FBI likes code-names; the agency's moniker for this operation was "Summer Solstice." According to the FBI, Summer Solstice didn't start until 2005. Undoubtedly, Microsoft had been agitating from early on for law enforcement to get involved, but until recently, there was apparently little traction with Chinese law enforcement. A key figure in the case provides a vivid example of the frustrations that both software vendors and U.S. authorities faced in trying to get intellectual property (IP) law enforced in China. Ma Ke Pei was indicted in New York in 2003 for allegedly distributing about $15 million worth of pirated Microsoft and Symantec products over a two-year period. Rather than face prosecution, he successfully fled the country and was able to not only elude U.S. authorities but also, allegedly, to set up a Shanghai-based pirating operation that focused on counterfeiting Symantec software. In July, Ma Ke Pei was among those arrested by Chinese authorities, who seized five of his real estate properties and $500,000 in other assets. China has two public images. One is of an authoritarian state where the central government asserts its control over everything. The other is a "Wild West" landscape where rapid industrialization and local autonomy mean central government edicts often carry little weight at the city level. Without more information about Ma Ke Pei's circumstances, it's impossible to say which scenario prevailed to allow his four-year immunity from IP law. According to John Gantz, chief research officer at research firm IDC and co-author of the book, Pirates of the Digital Millennium: How the Intellectual Property Wars Damage Our Personal Freedoms, Our Jobs, and the World Economy (FT Press, 2005), sufficient anti-piracy laws have been in place in China for some time. The desire to do something about theft is what has changed. "There are a number of things happening at once. China wants to clean up its act because the Olympics are coming to Beijing in 2008 and their image is tarnished from the poison pet food" and similar crises that turned a harsh spotlight on Chinese business and industry in recent months, Gantz says. In addition, he says the images of Microsoft and its chairman, Bill Gates, have been on the upswing in China, which affects public opinion there on software piracy. The 75 people on Microsoft's anti-piracy team weren't the only ones at Microsoft contributing to the case. In more subtle ways, Gates was helping to clear the way at the very top of the government for this and other IP-enforcement actions. In April 2006, when Chinese President Hu Jintao visited the United States for the first time, his first stop was the Microsoft campus, followed by dinner at Gates' $100 million home. While the topics of their dinner conversation weren't revealed, Gates said before the visit, "We're encouraged by China's efforts to strengthen intellectual property protection, which will provide the foundation for continued expansion of the IT industry in China." Despite the Ma Ke Pei example, Gantz says the recent arrests are not an example of the government rounding up the usual suspects. "This hurt somebody for real," he says. " It's not a showcase thing where everybody goes home." Like any competent computer entrepreneur, the pirates used the channel to get their products to customers. 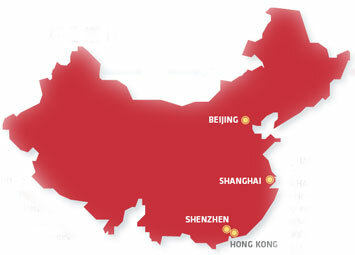 The route of the disks from the factory floors in Guangdong Province to U.S. customers' desktops, notebooks and servers passed through multiple resellers -- some witting and some unwitting accomplices. The ring shipped the counterfeit products all over the world. Customs officers seized thousands of disks in Beijing; New York; Cairo, Egypt; London; Vancouver, British Columbia, Canada; Hamburg, Germany; and other major cities. Technological clues aren't always enough to spot fake software; partners must use their business knowledge as well. Physical security measures are a good defense against piracy, but they're often not enough. Microsoft is proud of the physical changes it has made to disks and certificates of authenticity to foil pirates, such as the wavy-edged DVDs, dynamic stereograms, embedded holographs and a security patch that shows the word "Genuine" when the disk is tilted. But the changes aren't always enough for even sophisticated observers to catch, acknowledges Michael Beare, channel director for the Microsoft Genuine Software Initiative. "We've had Microsoft executives look at our software and counterfeit copies and they couldn't tell the difference," Beare says. If Microsoft itself can't tell a fake from the real thing, what's a partner to do? An exceptionally tough selling environment can be an early warning that someone in your immediate market is cheating. "I've just run into this in talking to a partner who was trying to sell Dynamics," Beare says. "They're trying to quote a deal, and they're having a tough time meeting some competitive quotes." If you run into that situation, contact a partner account manager (PAM) for help, Beare advises. "The PAMs out there are more than happy to sit down and address that, and we do receive a lot of reports that way." If the price from a distributor of Microsoft software looks too good to be true, there's a good chance that it is -- at least from a legal standpoint, Beare says. "The way some of us have been able to pick up problems is by spotting spelling mistakes in the manual or improper English being used," Beare says. Another red flag: Web sites that fail. "You'd think that's the one thing that should be easy enough to replicate, but that's one of those areas where counterfeiters still seem to have problems." Should your best efforts fail and your customers have warnings about non-genuine software popping up on their desktops, you still have options. "In some cases, it could be that the customer has been taken advantage of," Beare says. "Helping a customer is something we want partners to be able to do. In the cases where reports happen and high-quality software is submitted to Microsoft, we'll actually look at compensating a customer for that." It's worth asking on behalf of your customer, but don't expect too much. Asked how often Microsoft has actually compensated customers, Beare says, "I'd say it's several handfuls of times. Almost a bushel." -- S.B. Who first took possession of the disks in the United States, where most shipments were headed, is unclear. FBI officials from the Los Angeles office, which oversaw the two dozen raids at American sites, won't say whether those distributors were independent collaborators in the United States or were working out of facilities owned by the syndicate. "The case is moving toward prosecution, and we just don't comment on the case while it's in the prosecuting stage. We wouldn't be able to provide anything further until the case has been prosecuted and it's run its course," says Special Agent Kenneth Smith of the FBI Los Angeles field office. Thom Mrozek, spokesman for the U.S. Attorney's Office in the Central District of California, says that, as of late September, no casework had been filed in federal courts there. According to the FBI's public statement at the time of the raids, the Chinese-based distributors "advertised their products aggressively and recruited distributors via the Internet." Michael Beare, channel director of the Microsoft Genuine Software Initiative, says system builders -- the mostly smaller partner organizations that assemble PCs and servers from components -- are the major distribution targets for counterfeiters. There are an estimated 15,000 to 20,000 system builders in the United States, and the business is as margin-sensitive as any in the industry. "The majority [of pirated disks] go through a system builder, eBay or e-mail advertising things like a large warehouse closure," Beare says. "The replicators have gotten extremely good. In some cases, the product looks just like the real thing. A system builder who lives on the margin is very, very tempted to say, 'This looks like Microsoft. I won't ask too many questions,' and it works." According to Microsoft, more than 100 resellers were involved in bringing down the syndicate. A request by Redmond Channel Partner magazine to interview a reseller involved in the case was rebuffed by Microsoft's PR agency, which cited concerns about jeopardizing prosecution of the case. However, the company describes resellers as "playing a key part" in helping to trace the counterfeit software. Resellers provided e-mail messages, invoices and payment slips that moved the investigation forward, Beare says. Cooperation came in different forms. Some partners voluntarily submitted solicitation and other e-mails, alerting Microsoft to a target for "mystery shopping," in which Microsoft employees pose as customers or resellers and purchase software directly from pirates to gather evidence. Other partners were caught trafficking illegal software and were squeezed into participating in the investigation. "It takes a combination," Beare says. "Without the initial reports from those who are turning in those e-mails or saying they can't compete, we wouldn't have a trigger. Follow-up takes the shape of mystery shopping or figuring out what's going on. From then, it starts to get into building the case." Microsoft portrayed the enforcement efforts against the piracy ring as a win for its Windows Genuine Advantage (WGA) program, which served to alert thousands of customers that their copies of Microsoft software were counterfeit and provided leads for company investigators in the case. Little of the media attention to the case focused on WGA's success, however -- and any positive bump for Microsoft's "phone-home" piracy checks was overshadowed by the much more negative incident when Microsoft's WGA-checking infrastructure went offline for 19 hours over an August weekend, shutting down some users' Vista features and warning XP users that their copies of Windows might not be genuine. WGA remains a mixed bag for partners. While there's lingering uneasiness in the partner community about serving as licensing cops for Microsoft's Software Asset Management initiative and the difficulties present in partner efforts to be seen as trusted advisors, partners generally applauded the anti-piracy efforts that led to the recent arrests. "I love what they're doing," says Matt Sherocman, vice president of consulting services at PCMS Datafit, a Gold Certified Partner in Cincinnati. "Selfishly, as a partner that sells licensing, I want customers to buy software and be on compliant networks." Sherocman says the reduced-functionality mode in Vista has brought some new business to his door. "That's pretty heavy -- Microsoft takes your PC and turns it into a paperweight that you can copy data off of. We're getting some customers coming to us after WGA [shuts them down]," he says. The new business is good, and Sherocman says he's found that customers who balk at getting correctly licensed don't tend to be good customers anyway. "I tend to disengage with them as a customer if they're not ethical with compliance." Of any crackdown on VARs who cooperated with pirates, Sherocman says: "I think that's totally legit. VARs have an obligation to protect the industry that we work in." Scott Braden, a licensing analyst and frequent critic of Microsoft's licensing practices, is also supportive of Microsoft's crackdown efforts. "It's pretty straightforward. Resellers have a duty and obligation" to cooperate with Microsoft when pirated software turns up, Braden says. The ring is big enough that Microsoft officials expect a short-term decrease in the availability of high-quality pirated software. The medium-term outlook is mixed, but longer term the outlook is pretty good for declining piracy rates, experts say. To put the 55,000 seized Microsoft disks in context, Microsoft reports that nearly a million counterfeit Microsoft disks have been seized in the last 18 months alone by authorities worldwide. While the recent seizures make up a small percentage of that total, they represent a much higher percentage of the high-quality product. "High-quality" actually has a specific meaning in pirated software. Microsoft divides pirates' efforts into three tiers -- low-quality, medium-quality and high-quality, with the highest level being the most difficult to both produce and detect. IDC's Gantz agrees that the arrests are big enough to make an impact, but adds that high-quality pirates will be back on the offensive soon -- if they're not already. "China is the biggest supplier of pirated goods. Russia, Chechnya and the Ukraine are also big suppliers," says Gantz. "It's one of those things where it's pretty easy to get producing again unless they rolled up the whole distribution channel. It's safer than drugs, and the penalties are less severe." That said, Gantz sees worldwide piracy declining in 2007 and into the future due to the convergence of several factors. For one, software vendors are handling the public relations war against software piracy fairly well, says Gantz, who also monitors the recording and movie industries' efforts in his research. "The software industry seems to be taking care of business in an orderly way. I don't know about movies and music," Gantz says. Microsoft gets some of the credit, in his view: "They're not too heavy-handed, but there's always tension. [The WGA-server outage] was a black eye," he says. "Simpler licensing would help; they probably need that more than they need WGA." 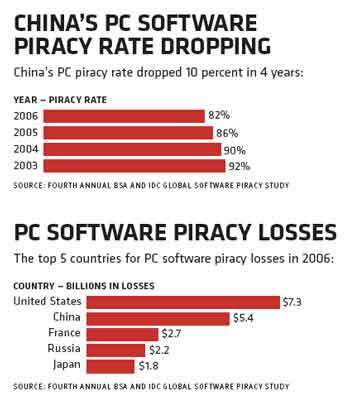 Other positive trends for reducing piracy include improved relationships among major software vendors with local OEMs in developing countries that choose whether to install pirated software or legitimate software; and the trend of replacing desktops with laptops, which are more difficult to stuff with counterfeit components, Gantz says. Finally, many governments are taking steps to join the World Trade Organization and want to build local software industries, he says. "To have a local software industry, you can't have piracy. How are you going to compete with a $2 word-processing product?" Gantz asks. "Government can be 6 percent to 10 percent of a market and set a good example." As uncomfortable and challenging as the current piracy climate can be for partners, it may ultimately prove to be a short-term problem. Microsoft-sponsored IDC white paper, "The Risks of Obtaining and Using Pirated Software"